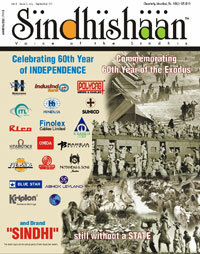 Your Vol-6 issue-1 of Sindhishaan came out well but for a big mix-up in 2 photographs. On page 12, it is Uttamchand Israni of Bhopal and not A J Uttam of Mumbai. And on page 47, it is Dr. Murlidhar K Jetley and not Dr. Jetho Lalwani who greets Shri Ram Jethmalani while Shamsher al-Hyderi looks on. Your photo editor should be more careful. The error is deeply regretted and Sindhishaan offers sincere apologies for the same to each and everyone whose sentiments may have been inadvertently hurt.